KSRealityBites: Dirt exposure improves children immune system! Dirt exposure improves children immune system! We all know about the most common childhood practice, i.e., playing with the dirt. Yes, this exposure to dirt has got an advantage according to a research study. Recently researchers have discovered its curative characteristics. 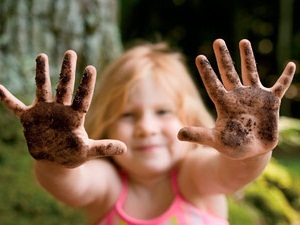 They claim that exposing kids to dirt could stimulate their immune system to help prevent allergies! Researchers of Brigham & Women's Hospital (BWH) have found the concept of 'Hygiene Hypothesis' to be true through their experiment. 'Hygiene Hypothesis' is the perception of exposing infants to germs to increase immunity in him. The researchers took two groups of mice, the first group consisting of completely germ-free mice & the second group with those, that are living in a normal environment with microbes. The researchers studied the immune system of both the group of mice & observed that the 'germ-free mice' had exaggerated inflammation of the lungs & colon resembling asthma & colitis caused by the hyperactivity of a certain class or immune cells. They also marked that exposing the germ-free mice t microbes during their first weeks of life only led to immune system issues, but not when exposed later in the adult life. Hence, we can assume that the concept that we are discussing is basically meat for children not for adults. Richard Blumberg, chief for the BWH Division of Gastroenterology, Hepatology & Endoscopy & the study author, working for Dennis Kasper, also the director of BWH Channing Lab said, "These studies show the critical importance of proper immune conditioning bymicrobes during the earliest periods of life." Although hygiene decreases our exposure to harmful bacteria it also limits our exposure to beneficial micro-organisms. Hence it will not be wrong to say that the more sterile the environment a child lives in, the higher the risk he will develop allergies or an immune problem in his lifetime!